Super-cute decorated holiday cookies: How to make bite-size Christmas cookies in a jar. Great handmade gift idea for the holiday season! 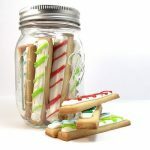 I’m keeping things simple this year and going with my standard for Christmas gifts: bite-size Christmas cookies in jars. Mason jars are just so perfect for packaging. I made all of mine in advance and put them in the freezer. You can dress them up with tags, felt, ribbon, whatever, and even attach gift cards, as I’m doing with the teacher gifts. I added some printable tags and all done. For the Christmas cookies, I chose Santa, candy canes, snowflakes, snowmen, and snowballs. I just made my go-to sugar cookie recipe and royal icing. 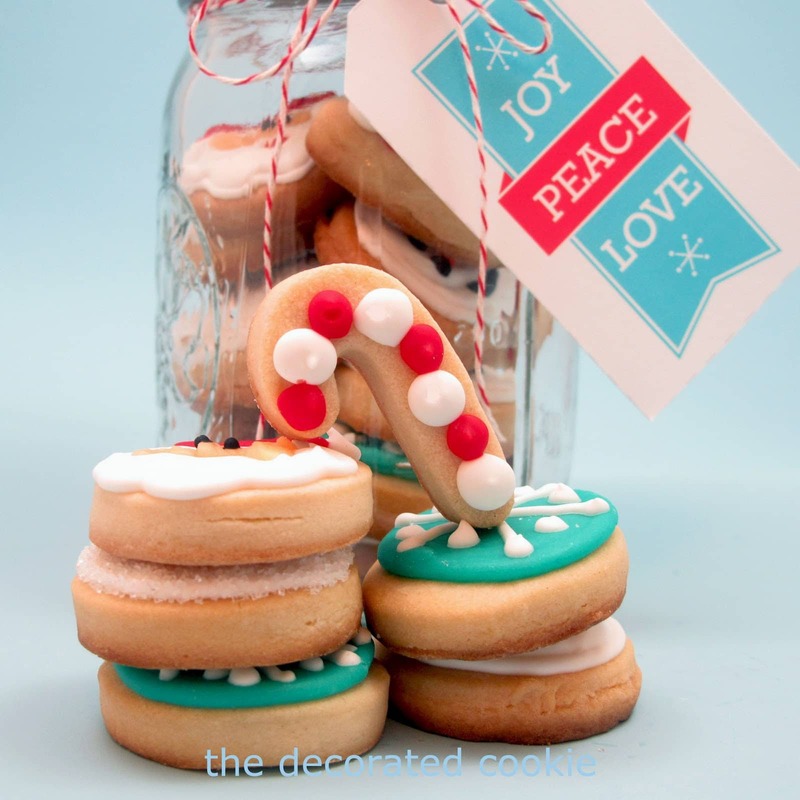 All the cookies are cut out on 1 1/2-inch circles except for the mini candy canes. I tinted the icing my colors with Americolor Soft Gel Pastes. I prepared decorating bags with couplers and size “2,” “3,” or “4” tips. 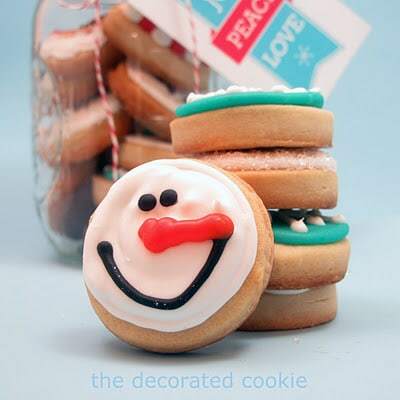 Find bags, couplers and tips at the craft store, or click HERE for tips on finding cookie decorating supplies. 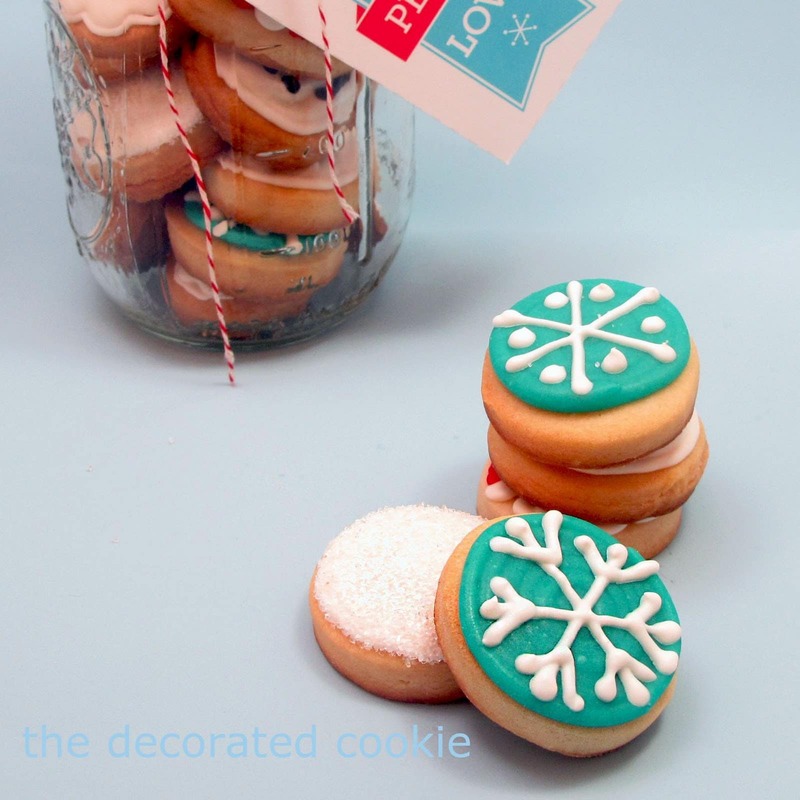 For a quick tutorial in cookie decorating, click HERE. 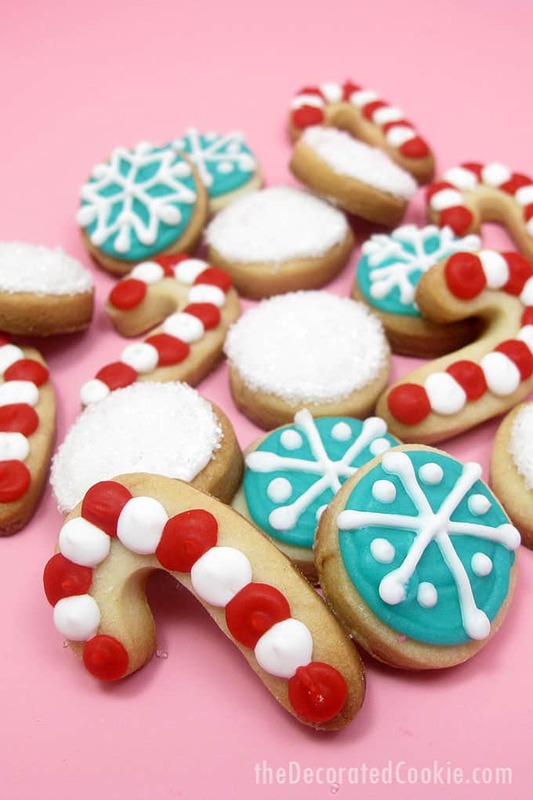 After decorating the cookies, let them dry well overnight. I piped the white on the hat and outlined the mustache and beard with white icing using a size “2” tip. Let it set a bit, then piped to fill the white, red and peach with a “3” tip. I piped dots with a black “2” tip. I used a mini candy cane cutter that came with a set and piped red and white dots with a “3” tip. I just piped and filled white circles with a size “3” or “4” tip and immediately coated with white sprinkles. For the snowflakes, I piped a turquoise background with a “4” tip, let it set a bit, then piped a white snowflake with a “2” tip. For tips on drawing snowflakes, click HERE. I piped and filled white circles with a “4” tip, let set a bit, then used a black “2” tip for the smiley face and an orange “3” tip for the carrot nose. 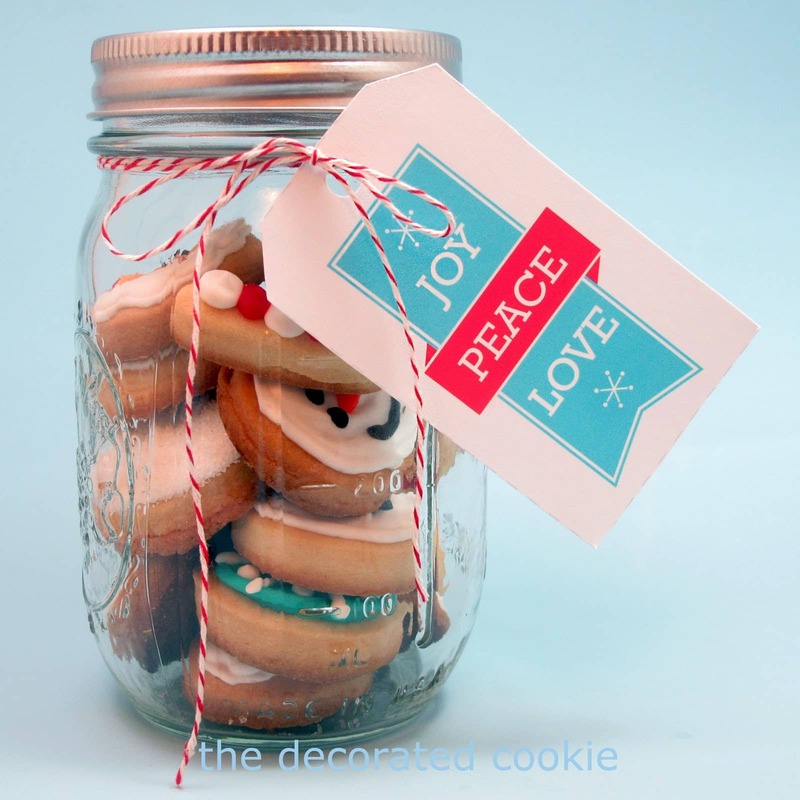 Mini cookies, jar, cute tag~what could be better?!? LOVE! Super cute, when I make my minis they are not as cute as your at all. I love using jars too! They look so super cute!! I love the little Santa. 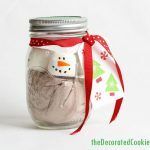 Do you freeze the cookies in the jar or freeze them flat then thaw and package? I stick the whole jar in the freezer, though the better advice is to freeze them in freezer-safe Ziplocs flat and then package. But the one important thing to note is to let them thaw TOTALLY in the bag before opening the bag. Otherwise they can get condensation and the icing bleeds. So funny that you post this now because I have been in the decorating mini cookies for the last 3 days for just this purpose. I have 8 jars to make by Tuesday and another 8 to make by the 23. I did a bunch of different mini shapes but I am now thinking that mini circles are the BEST …lol. 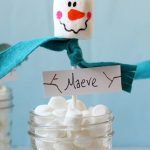 This is a great idea for little kids too–small sizes mean a little less sugar but all the fun! Totally beautiful and thank you for the inspiration. I'll come again…often! love the santa how too – going to be making him I bet real soon!! Thanks! Bite size is perfect size especially when they are as adorable as all of these. 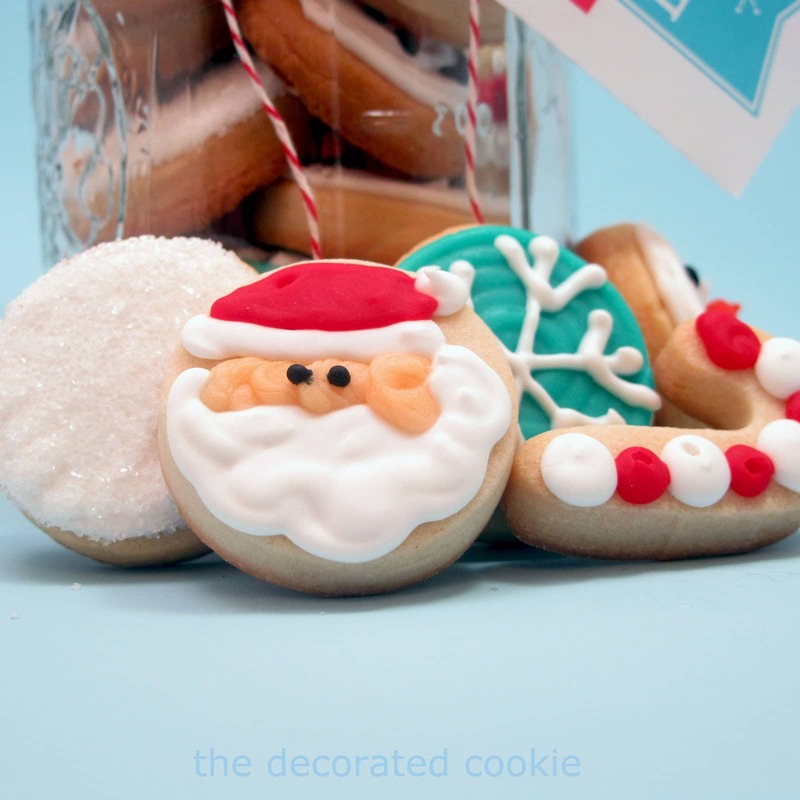 Love how you did the candy cane cookies. Those are precious. 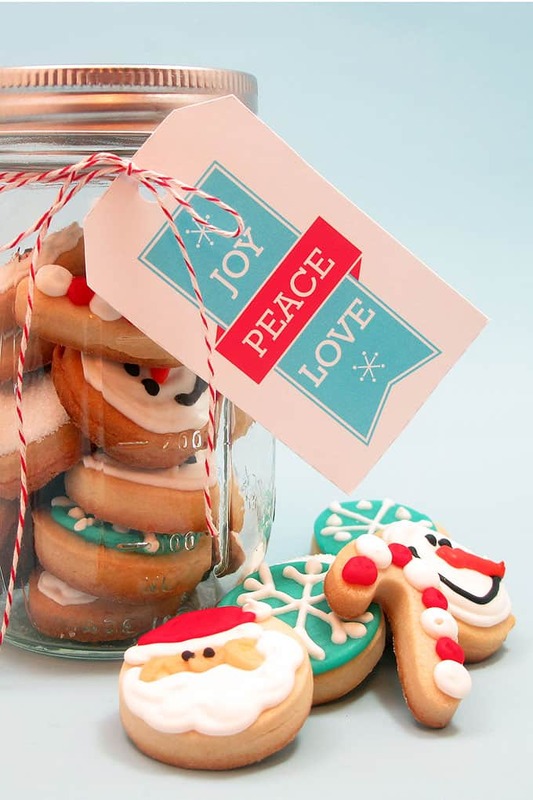 I sure would love to get one of your jars of cookies! Who wouldn't be thrilled to receive these cuties this Christmas?! What size is your mini candy cane cookie cutter? 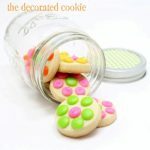 I’m having trouble finding the right size (so the cookies neatly fit in the jars with other cookies). Also, how far in advance can you make and freeze? Thanks so much!! Hi Amee! I used the standard Ball mason jar, which is 1 pint. I’ve found the jars in hardware stores, the supermarket, craft stores… They are about 10 bucks for a dozen. I love my mason jars :).